Jay Shah had filed a criminal defamation case against 'The Wire' last month over a report that claimed the turnover of his firm grew exponentially after the BJP came to power at the Centre in 2014. 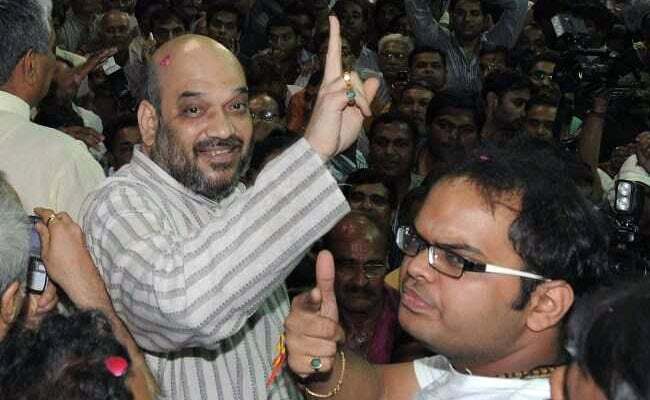 BJP chief Amit Shah's son Jay Shah (right) has sued the website The Wire and its representatives. Ahmedabad: Five persons associated with news portal 'The Wire', who were made accused in a defamation case by BJP chief Amit Shah's son Jay over a report about his company's soaring fortunes after the saffron party came to power at the Centre, today appeared before a city court. Those who appeared before Additional Chief Metropolitan Magistrate S K Gadhvi were author of the article, Rohini Singh, founding editors Siddarth Varadarajan, Sidharth Bhatia and M K Venu, and managing editor Monobina Gupta. Two others - public editor Pamela Philipose and a representative of the Foundation for Independent Journalism, the non-profit company that publishes 'The Wire', could not appear citing different reasons. They were subsequently served summonses by the court and asked to appear before it on December 16, the next date of hearing. During today's hearing, the first after the court issued summonses to all the seven accused last month, they were given various documents related to the case to prepare their defence. The court had exempted Jay Shah from appearing in person today owning to some social obligations. Jay Shah prayed for criminal action against the respondents for "defaming and tarnishing" his reputation by publishing the article, which was "scandalous, frivolous, misleading, derogatory, libelous and consisting of several defamatory statements". The case was filed under IPC sections 500 (defamation), 109 (abetment), 39 (voluntarily causing grievous hurt) and 120 B (criminal conspiracy). A person guilty of criminal defamation faces simple imprisonment for a term which may extend to two years, or with fine, or both. His lawyer S V Raju had earlier submitted before the court that the purpose of the article was not to give a bonafide account of the company or his client but to defame him keeping in mind the upcoming Gujarat assembly elections. He said there was "something fishy about the article" as it was "published hurriedly to make it an issue for the elections". The Wire had claimed in its report that the turnover of Temple Enterprise Pvt Ltd, the company owned by Jay Shah, grew from a measly Rs 50,000 to over Rs 80 crore in a single year. A political storm erupted after the article titled 'Golden touch of Jay Amit Shah' was published. The Congress demanded sacking of Amit Shah as BJP chief and institution of a judicial inquiry into the entire episode, while the BJP called the article "defamatory".